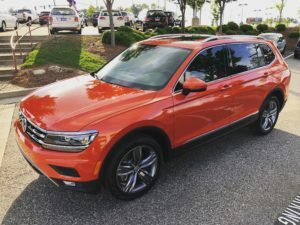 I leased a 2018 Volkswagen Tiguan SEL Premium (the absolute top trim model) on May 24, 2018. I was initially very excited, as the vehicle was quite nice looking (I even opted for the brightly colored “Habanero Orange” one) and had all of the features I was looking for – navigation, premium sound, panoramic sunroof, LED headlights, CarPlay, and safety/driver assistance features. My excitement quickly waned, however, as I began experiencing problems almost immediately with the vehicle (less than 500 miles after taking delivery). I’ve had a lot of issues, but make sure to read through to the end — my issues with the Lane Keep Assist feature are severe and should be enough for Volkswagen to comply with my request to repurchase the vehicle under Georgia’s Lemon Law statute. They’ve refused to do so. Have you also had issues with your Tiguan (or another Volkswagen vehicle)? Help me out by sharing this post so others don’t make the same mistake we did. Links to easily share the post are at the bottom. Your comments/stories are helpful and welcome also! Wow, way to build a quality vehicle. Not even four months into ownership and I already have chrome trim coming loose from the front of my Tiguan. I pop it back into place, but it will randomly pop back out every so often. I have had a few vehicles in the past with Auto Hold, a very useful feature that keeps the brakes electronically applied when at a stop so that you don’t have to keep your foot on the brake if you’re stopped for a long time (nice at drive-throughs, long traffic lights, etc.) So I was excited to see that the SEL Premium came with such a feature — or so I thought. Pressing the button did nothing whatsoever; the light on the button did not illuminate and the vehicle did not remain stopped when I let go of the brake as it should have. The infotainment system in the Tiguan is very buggy and will randomly stop responding to input, or the navigation will stop displaying, or it will have severe sound distortion issues. Some of these issues will require me to restart the infotainment system (not a big deal, but annoying nonetheless). Other times it requires restarting the entire vehicle to reset it, which as you can imagine is beyond frustrating when, say, on the freeway at the time an issue occurs. The Tiguan has a very rough transmission that feels like it’s almost trying to stall out at lower speeds, such as when starting from a complete stop. It will suddenly lose all acceleration and then lurch forward unexpectedly. It doesn’t do it all the time, either, so it makes the driving experience very unpredictable (not a good thing when trying to, say, cross oncoming traffic). I have had the dealer reset the transmission program and it seemed to help for a while but the problem is happening again. A rough illustration of how the blind spot malfunctions on my 2018 Volkswagen Tiguan SEL Premium. More than once now, I’ve had an issue with trying to steer into a lane next to another car (such as while merging onto a freeway into fast-moving traffic). The Tiguan will sense the vehicle in the lane to my left and will try to push me back into the lane to my right, thinking I’m about to collide. I haven’t even come close to entering the lane with the other vehicle, and yet it tries to push me out of the lane I’m trying to safely move into. Each time this has happened, it has nearly caused a collision because another vehicle had moved to the right of me, seeing that I was moving left. Extremely unsafe. Adaptive Cruise Control is one of my favorite vehicle features. Who doesn’t want to just sit back and let the car worry about the acceleration and braking? However, I have noticed one major problem with this feature on the Tiguan — if a vehicle in front of you decides to move over a lane and decelerates quickly after they’ve already switched lanes, it will cause you to very quickly decelerate as well, which can cause the vehicles behind you to narrowly avoid a collision (and, at best, be mouthing obscenities at you from behind the wheel of their own car). There is no reason for the radar sensors to track and respond to the actions of a car once it has left your lane, and yet… that’s exactly what it does. 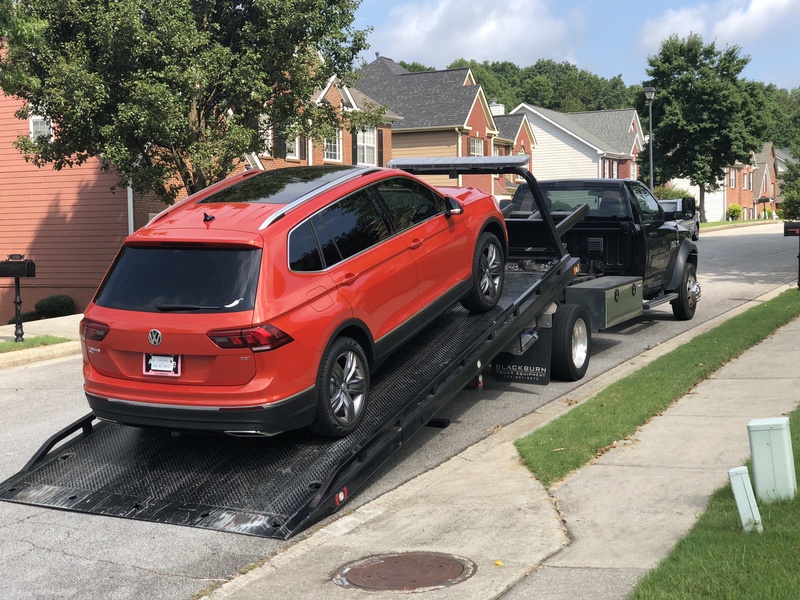 Within just a few weeks of getting my Tiguan, I received an urgent notice about recall #18V324, an issue so severe I had to have the vehicle towed to the dealer. I couldn’t even drive it there according to the warnings in the recall. The fix was a quick one, fortunately, but it definitely made me start to question the quality of the Tiguan — especially since, by this point (even though I only had about 1300 miles on the vehicle) I had already been experiencing many of the other issues in this post. The LED module for the panoramic-sunroof ambient light bar may short circuit, increasing the risk of fire. Dealers will disconnect the power supply for the panoramic-sunroof LED module until a future service action can safely reactivate the feature. The Tiguan has a “safety” feature (in sarcastic quotes for soon-to-be-obvious reasons) that is intended to keep the vehicle in its lane even if it starts to drift a little bit. 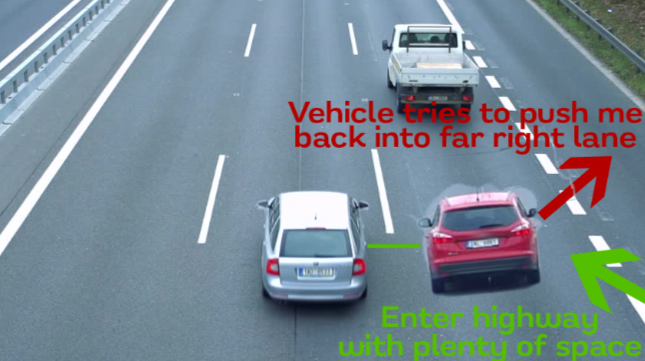 It is supposed to provide subtle steering input as necessary in order to ensure the vehicle doesn’t leave its lane. However, as you can see from the video below, my Tiguan intermittently (but frequently) attempts to aggressively steer out of the lane I’m traveling in, often causing me to nearly collide with other vehicles. When this happens, I have to actively wrestle with the steering wheel in order to regain steering control over the vehicle. This is a severe safety issue which Volkswagen is refusing to acknowledge nor do anything about. The Lane Keep feature is part of a safety package for which I’ve paid extra on my vehicle (having purchased the top trim level). Yet, the only answer Volkswagen will give me when I report this issue is that I should deactivate it if I’m concerned. Wait… I should deactivate a safety system to make myself safer?! Are you people even listening to yourselves? The front assist (frontal collision avoidance) system on my 2018 Volkswagen Tiguan is WAY too sensitive, even with the warning time turned to “late”. I was nowhere near the vehicle in front of me, and the Tiguan slammed on its brakes unexpectedly. This is another pretty serious safety issue as it could cause a vehicle behind me to collide into me due to my sudden, unexpected braking. The Volkswagen Tiguan is full of quality issues, both minor and major, and I don’t trust that these quality issues will ever be able to be resolved to my satisfaction. I have tried very, very hard to be patient with Volkswagen in regard to my issues with this vehicle. However, they’ve been nothing but dismissive (both at the dealership and corporate level), essentially telling me that the problems I’m experiencing aren’t really problems. Worse, they are refusing to comply with the law in Georgia by honoring my request for a repurchase of the vehicle. Georgia’s Lemon Law statute requires that a safety issue only gets one repair attempt before the vehicle is considered a lemon. The lane keep issue has now had three attempts from two different dealers, and neither of them were able to do anything to solve the problem. I will never buy another Volkswagen, and would strongly recommend against any of you buying one either. You will wish you hadn’t. Are you a media agency or journalist looking to contact me for a story regarding this post? Please feel free to contact me any time. I look forward to hearing from you. thanks for the information, I just went through a 2 and half year ordeal with Ford about a 2016 Lincoln MKX. They finally agreed to settle but I had to hire an attorney. I’m still traumatized about buying a new vehicle. Your information is very helpful to me, thank you again. I had truly unfortunate experience with Audi Q7 TDI also made by VW. faulty fuel pump spits metal particles into the engine. The problem well documented, but WV denies any responsibility. On top of cheating on diesel emissions, this company is unethical, dishonest, and fraudulent.